Last time I wrote for this blog, it was to tell the stories of a small environmental success and a travesty of oil company pollution of monumental proportions, both in Ecuador. But today a happier topic--eco-friendly destinations in Costa Rica. My friend Nicole is an American anthropologist who has for many years been deeply involved in conservation efforts in Costa Rica. On my January visit, she was an enormous help, telling me where I could find two beautiful natural environments, with accomodations run by people dedicated to preserving and sharing a pristine environment. She spent hours making arrangements in her fluent Spanish, but it can all be done on line English, so don't fear. And now I will share them with you. The first is a tiny and charming hotel in the mountains about 2 hours from the capitol, San Jose, called Paraiso de Quetzales (www.quetzalsparadise.com). 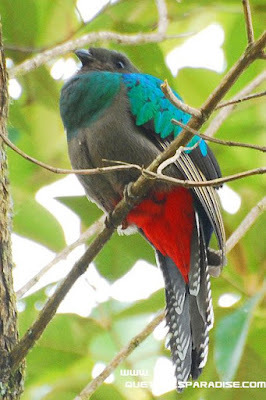 I was to learn that the beautiful quetzal bird you see is not mythological, as I'd thought, probably confusing it with the phoenix. We were lucky to be there in late January, the beginning of the nesting season, and to see a tranquil pair seated near each other on different branches. We delighted in the beautiful tails of the male and the sweet little head with its punk feather-do. Jorge Serrano, who owns the hotel and the lovely hilly land around it, is a man who loves his job being close to nature, and makes sure the land is taken care of. He runs the hotel with his kind and gentle teenage son. Both speak passable English. I was surprised when I left by a hug from the son. Can you imagine a teenage boy hugging a paunchy middle aged woman? Spontaneously? But that was just the last delight of many. For a modest sum of $62/person you get a tiny cabin with 4 heavy blankets (it's freezing in the mountains--bring winter togs), a good dinner near a friendly wood fire (fresh trout from a neighboring fish farm is an option), breakfast and an early morning walk to find the birds. Other times, you can hang around in the cozy living/dining area, or walk through it to a balcony overlooking a hummingbird garden. 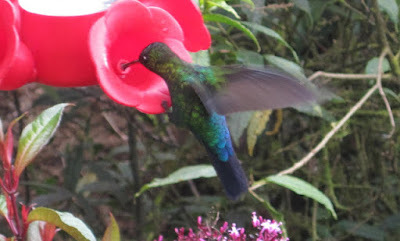 This is my picture of the Magnificent hummingbird. He obligingly posed. As I spent a lot of the afternoon trying to capture these fleet creatures in flight, the day finally melted into the sunset you see. 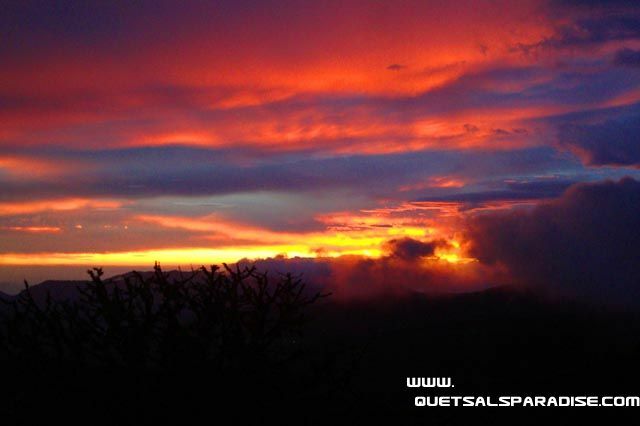 You can find a whole gallery of pictures at www.quetzalsparadise.com. A good place to start your trip is at my friend Carol's B&B, Rainforest Dreams, located in Escazu, a suburb of San Jose, the capitol. You will delight in her company and knowledge of the country, and enjoy the simple but pleasant atmosphere at a moderate price. Find it at rainforestdreamscostarica.com. For another beautiful coastal destination, see Part II. Buen eco-viaje, amigos! You read about our quetzal quest in the mountains if you read Part I. Following that, we headed west for a boat trip in a mango swamp off the coast at Isla Damas (Women Island, so named for its hourglass shape.) 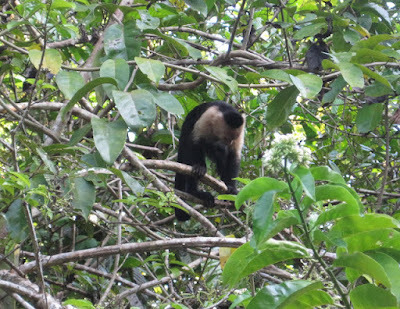 The Island is near one of Costa Rica's most popular tourist destinations, Manuel Antonio, famed for its lovely beaches. 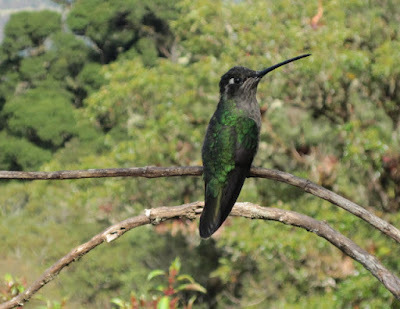 Though I'd lived in Costa Rica for three years, I never got there, and wanted to go. But in retrospect, if you have limited time on the coast, for my money, do the Damas Island tour (or a host of other tours offered by the same company, Iguana Tours, at www.iguanatours.com). 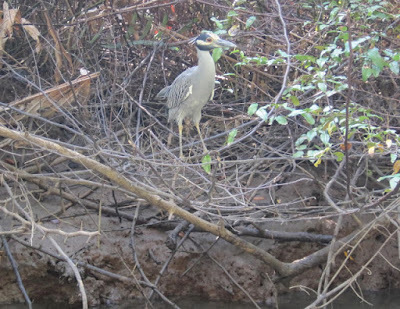 We did a guided bird walk at Manuel Antonio, and there were so many tourists (about 5 groups, each about 10 people), that any bird with sense was far from the trail. We did see a sloth or two and assorted reptiles. The beaches were gorgeous--little jewels in bays with trees, as lovely as the best Caribbean beaches. The park is pristine, and there are no stands or stores. Bring your own food and anything else you need. That said, I can rave about our mango tour on a motor launch with a canvas "roof" and an expert, bilingual guide. The area will remind you of the everglades, if you've been there. 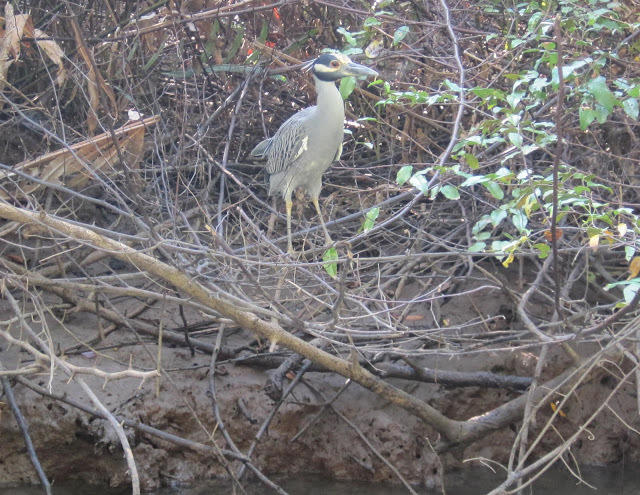 We saw what you'd expect--lots of beautiful shore birds, like the golden-crowned night herron pictured. We learned that this smart guy catches insects, wounds them so they flutter madly, and then uses them to attract fish, his real target. Smart as he is beautiful. We also were treated to a monkey show. 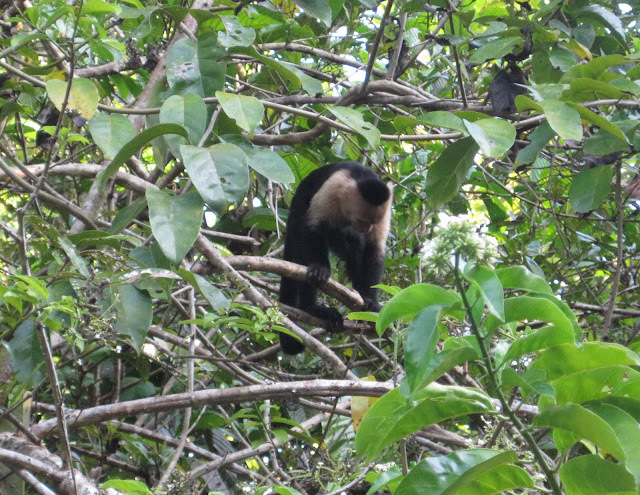 We saw a whole troop of whitfaced capuchin monkey, including several mothers with babies on their backs. As we were enjoying watching them feed and jump, suddenly the whole troop decided to cross the canal, right in front of our boat, leaping from trees on one bank to the other. I totally forgot I could take video with my little point-and-shoot, but I did manage a mediocre still of a mom with babe, just before she reached her target tree (below). Again, the guy in charge (not sure if he's the owner) is Jorge Cruz. He is another devoted lover of nature. When I mentioned Nicole, he said she was a very good friend. The tour was $40/person for us, because we arranged it ourselves. Others who booked through their hotels paid $60, presumably there was a $20 cut for the hotel. Here's how it works. They pick you up early in the morning (about 6:30 if memory serves--you birders know the birds don't wait for late risers). They take you to the boat launch area and provide a snack, mainly fruit and cookies. Our hotel served good coffee at 5:30 AM, as I imagine most do, since they house many birders. Aftert the trip, which lasts about 2 hours (it goes by in a flash), they provide a full breakfast (with coffee this time). One last thing--your hotel. As you might imagine, hotels in the Manuel Antonio area tend to be pricey. We stayed at one which was not only moderate in price, but had an ecological mission. It's called Hotel Mono Azul (Blue Monkey, at hotelmonoazul.com). The website lists a host of environmentally friendly measures, such as using waste food to feed animals, non-toxic detergent and cleaning products, etc. The daughter of the owners, when she was 13 years old, wanted to do something to help the rainforest. So she organized Kids Saving the Rainforest. Young people around the world can join, and contribute money, or do something that serves a rainforest where they live. We heard of one boy, I think in India, who lived in a place where there were many poisonous snakes. Many people killed them. But this brave soul captured them and returned them to the forest. If you buy anything at their gift store, all proceeds go to KSTR. The hotel is attractive, accomodations are acceptable but not luxurious. Food is ordinary. The price was $52/person, not including breakfast. Like I said, prices in the area are higher than more remote destinations. Buen eco-viaje, amigos! Well maybe not exactly summer, but certainly late Spring. We had high 70’s temperatures in Philly last week. I loved every minute of it and was out there cleaning beds, dividing daffodils and fertilizing. 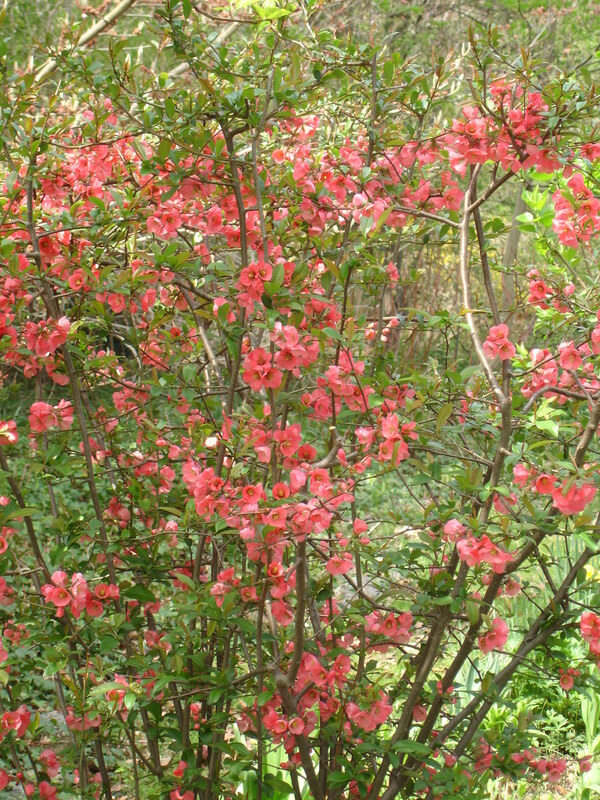 Yes, you can divide bulbs when the foliage is still green as long as there is enough moisture in the soil. This March has been magical—I've actually been spending balmy days working in the garden in March!! However,it is worrisome—what in the world is happening to our planet? 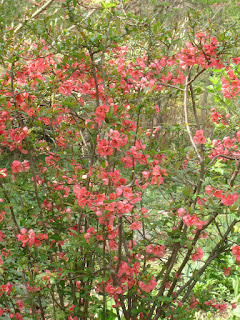 But I admit to really enjoying the early spring. 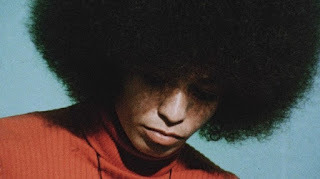 Every month when I get my netflix bill I think about getting rid of this subscription I rarely use, but when I rent something like The Black Power Mixtape it all seems worth it. The Black Power Mixtape 1967-1975 is a documentary consisting of interviews conducted by Swedish television journalists; the footage remained buried in the archives of Swedish television for over 3 decades and has recently been edited and released. The film brought back the intensity of those days when the world seemed to be coming apart—-the assassinations of Malcolm X, Martin Luther King and Robert Kennedy, the killings at Kent State, a time when the forces of the state (J. Edgar Hoover’s FBI, many local police forces) were out to destroy radical challenges to the existing order. The film includes interviews with Stokely Carmichael, Angela Davis, Louis Farrakhan, Huey Newton and Bobby Seale, among others. By far the most powerful segment was the interview with Davis while she was awaiting trial on charges of providing the guns used in a California courthouse shooting that left four people dead. Responding to a journalist who raised the issue of Black Power advocates’ justification of violence, she bitterly attacked a society that ignored and in some cases condoned a history of violence against African-Americans. With cold fury she replies to the Swedish journalist: "When someone asks me about violence, I find it incredible. A person asking that can have no idea about what black people have gone through in this country." For me the biggest surprise was the interview with Stokely Carmichael, especially the segment when he interviews his mother about the effects of poverty and discrimination on her family. Carmichael is clearly a man who loves and respects his mother. He comes across in the film as at times gentle, witty, ironic—very different from the angry militant I remember who famously said in response to a question about the position of women in the Civil Rights movement, “The position of women in the movement is prone.” This anecdote has been retold in countless feminist histories of the 1960’s and Carmichael has been roundly condemned for his sexism. He later said it was a joke. I saw that as an attempt to defend the indefensible. But after seeing this film, I think it is entirely possible that the Carmichael portrayed here might have been joking. The very fact that he would make such a joke says volumes about the culture of the times—-the social movements of the 1960’s were riddled with gross sexism. However, Carmichael just might have been making a crude joke rather than issuing a proclamation on women’s inferior position. The DVD includes additional interviews,including one with Shirley Chisholm which for reasons I cannot understand was not in the film. Perhaps this was because Chisholm was not using the incendiary rhetoric of the Black Panthers and other Black Power militants, but clearly she was an advocate of Black Power. If you rent the DVD, don’t miss the interview with Chisholm in the supplementary material. On March 1, I attended the PA House Judiciary Public Hearing on merit selection on behalf of the Philadelphia Democratic Progressive Caucus. This is something I would never have squeezed into my schedule if I were not retired. Merit selection (an appointive system of choosing judges) is not one of those hot button issues that grab the attention of the public. I probably would not have taken any interest in this issue were it not for my almost three decades as a Democratic committeeperson—a job I enjoy EXCEPT for the task of recommending judicial candidates to my neighbors. It is extraordinarily difficult to get reliable information about judicial candidates and I’m uncomfortable making endorsements when I don’t feel I can personally vouch for these candidates. Last January, Philadelphia Democratic Progressive Caucus Chair Gloria Gilman organized a meeting of a group of civic/advocacy organizations with representatives of the Philadelphia Bar Association to express our dismay at their recommendation of recently elected Common Pleas Judge Thomas Nocella, who has a well-documented history of ethics violations and other dubious practices. The officers of the Bar assured us they were making changes to their process which should prevent another such occurrence. But given the serious problems with our system of electing judges, an improvement in the Bar Association’s internal process for recommending judicial candidates is not enough. There seems to be some momentum in favor of the bill; however, change will not be easy. Moving to merit selection requires a constitutional amendment. The proposed constitutional amendment (HB -1815) can be read here, and the implementing legislation (HB -1816) here. The legislature must pass the bills in two consecutive sessions and the final decision is made by the voters in a referendum. Why not include trial courts? …the gauntlet that he had to go through, which is the same for everybody running for Common Pleas Judge in Philadelphia, is unfathomable. It requires spending huge sums of the candidate's own money, payable to ward leaders and other political operatives, money which is euphemistically known in Philadelphia politics as "street money", and which is used to pay for what is also euphemistically known as "election day expenses." A state grand jury report of a decade ago and a Philadelphia Magazine article a few years back described the amounts spent by a judicial candidate for Common Pleas Court in Philadelphia as running into the hundreds of thousands of dollars. Presiding at the swearing-in was a Pennsylvania Supreme Court Justice who took pains to recognize all the elected officials present, including ward leaders. One former Councilman and ward leader in particular that he singled out was Leland Beloff, who some years ago received a ten year federal prison sentence for trying to extort $1 million from a Philadelphia developer. However, as long as we have a system of electing judges we will always have, and can expect to have, not only the infusion of vast sums of money, but the involvement of those who have gone to jail for violating their public trust, now posing as political operatives, profiting handsomely from the process and being recognized at swearing-ins. To borrow a line from the film Godfather II: "This is the life we have chosen." Well, this is the system Pennsylvania has chosen, so we can hardly complain if convicted felons play a role in it, since there is nothing to prevent them from participating and making money off the candidates who are running for judge. The public, however, might be understandably upset if they knew how many bright, competent, honest attorneys are deterred from seeking the bench because they know what they have to go through to get there. The public might be doubly upset if they knew that under our system people who have been convicted of serious crimes involving a violation of their public trust play an integral role in how we select our judges. Maybe, just maybe, it's time to change the system. I’ve quoted Mr. Philips' testimony at length because it was so compelling, one of the highlights of the hearing. It was surprising after this powerful testimony to hear his uncertain reply to the chairman’s question as to why he was not also advocating for merit selection for the local trial courts. He replied that people in other parts of Pennsylvania were not unhappy with their local courts. The representatives of PMC made a similar response when the question was posed to them. Both Philips and the PMC representatives assured the Judiciary committee that they were only advocating for change on the appellate level and had no plans to extend this to the trial courts. I assume they’ve done their research and came to the conclusion that the votes were not there for a bill which included trial courts. Although most of the testimony at the hearing was solidly in favor of both the principle of merit selection and the plan proposed in HB1816, there is considerable opposition out there. The opposing arguments fall into four main categories. First, opponents argue that the bill will never succeed in its objective of taking money out politics. Supporters concede there is no way to take money completely out of the process but merit selection can prevent money from directly changing hands between trial lawyers and judicial candidates. If they are not independently wealthy, judicial candidates have little choice but to raise money from trial lawyers. The only people (other than the candidates’ friends and relatives) who give to judicial candidates are trial lawyers who might later appear before a judge to whom they had contributed. Judicial candidates are frequently indebted both to trial lawyers and to the Party machine; this hardly inspires confidence in the independence of the judiciary. A second argument is that in a democracy the people should choose their judges. But that does not happen; voters have opted out of the process. In an off-year election when many local judicial candidates are selected, turn-out is often quite low—-between 15% and 20%. However, that figure is the number of people who came out to vote; cut that in half for those who vote in judicial elections. Even in my middle class Mt. Airy neighborhood, with a high percentage of educated voters, about half choose not to participate in judicial races. Committee people get the number of undervotes in each election—-that is, the number of people who did not vote in a particular race. I’ve been checking this for years now and the pattern is consistent. Participation drops off dramatically in the judicial races. One interpretation is that the people are sending a message that they do not want to elect judges. Proponents of the bill argue that HB1816 gives the people the right to decide if they want to change the way judges are selected. The results of a popular referendum rather than the votes of legislators will determine the ultimate outcome. Also the people will have the final say in retention; although the initial appointment will be made by a nominating committee, the voters will make the decision whether judges should be retained. Unlike the present system in which judges do not come up for retention for ten years, under the proposed merit selection system judges will come up for retention after 4 years. If retained they will then have a ten year term. The bill builds in a relatively short probationary period. Third, there is the slippery slope argument. If we take away citizens' rights to vote for appellate court judges soon we will be getting rid of elections all together. This was the argument presented by Temple University Law Professor Marina Angel in written testimony: “Why stop at taking away the right to vote for appellate judges? The same arguments can be made by a group called ‘Pennsylvanians for Modern Democracy’ for all elections. Voters don’t know who they are voting for and elections are too expensive, so let’s have the state and the country run by an elite group of the ‘merit-selected.’” This is quite a leap; judges are are different from legislators. As Andy Hoover, Legislative Director of ACLU PA, stated in his written testimony in support of the bill: “Too often, those most in need of protection under the law are not popular with the majority, including religious minorities, criminal defendants; lesbian, gay, bi-sexual, and transgender people and ethnic minorities. Judges must be comfortable ruling on the law and not what will resonate in the next election.” Merit selection can (to a much greater extent than electing judges) insulate judges from the vagaries of popular opinion, thus affording greater protection to minorities. Merit selection has the potential to expand the applicant pool: how many well-qualified women and minorities who might make excellent judges have not run for election because they lack the financial resources and/or don’t want to participate in a process riddled with potential conflicts of interest? Advocates of electing judges often say that the electoral process provides an opportunity for a candidate who might never get through an appointive process. No doubt this is true, and this includes some seriously tarnished candidates like Thomas Nocella and perhaps some worthy candidates as well. However, many good candidates who might make excellent judges will not get down into that gutter. This is going to be a long protracted struggle. Some of the opposition is principled; some is more self interested. Local judicial elections are big money-makers for the Philadelphia Democratic Party; it's not surprising that local party operatives have their own fears of a slippery slope.